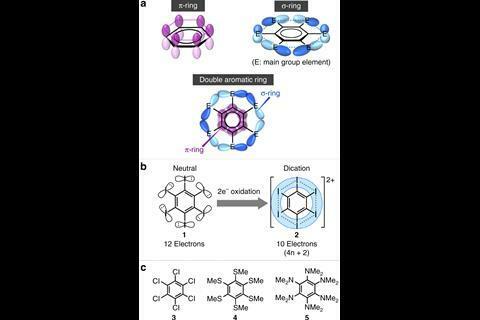 A standard π-aromatic benzene ring inside another aromatic ring made out of overlapping selenium σ orbitals – this strange beast is the first double aromatic molecule. Previous research hypothesised double aromaticity more than 20 years ago, but a stable compound had so far never been made. Aromaticity profoundly alters a molecule’s properties, making it more stable than its non-aromatic counterpart, changing its reactivity patterns and flattening its structure. Chemists are fascinated with such molecules and have bent and twisted the rules around aromaticity in various ways, from making Möbius molecules to creating inorganic versions of benzene. Now, scientists from Japan have added another member to the aromatic zoo: the double aromatic hexakis(phenylselenyl)benzene dication. In aromatics, electrons freely flow around a ring made out of overlapping orbitals – usually of the π variety – between neighbouring atoms. In this compound, however, five pairs of overlapping σ orbitals between the selenyl substituents create a secondary aromatic ring around the benzene core. This outer ring contains 10 delocalised electrons, satisfying Hückel’s rule for aromaticity. The selenylbenzene cation, made by two-electron oxidation of the neutral precursor, is the first bench-stable double aromatic molecule. Previous examples included metal clusters and mixed carbon–boron rings that had been only observed in the gas phase. 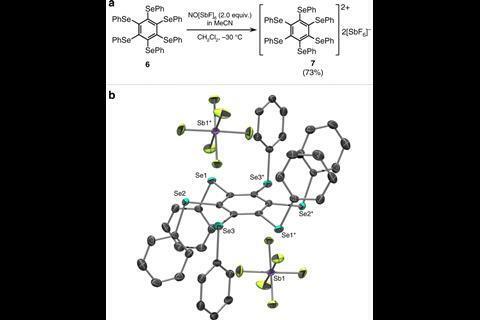 By x-ray crystallography, the team showed that the selenium atoms were at equal distances from each other, just like carbon atoms are in a benzene ring. 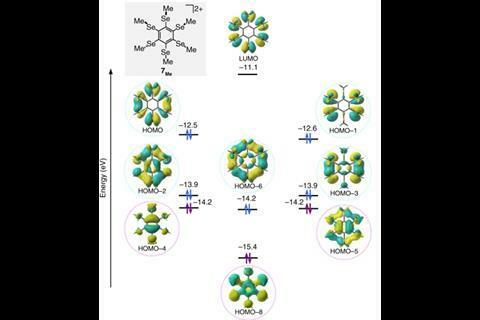 Such compounds don’t just extend chemists’ understanding of aromaticity, but could also be used as charge transport systems, the researchers note.